Puttur, June 24, 2015: Noted entrepreneur, social worker and religious leader Usman Haji Mittoor of Manjalpadpu breathed his last on June 22, Monday night. He was 65 years of age. Usman Haji was also the Founder President of Markazul Huda Women’s College at Kumbra here. 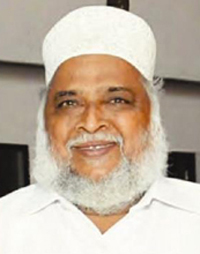 He was associated with various organisations and was a member of Dakshina Kannada district Wakf Advisory Committee, Samastha Kerala Sunni Vidhyabhayasa Board’s Central Committee, State Vice President of Karnataka Muslim Jamaat Council and Treasurer of Dakshina Kannada district unit of Sunni Management Association among others. Usman Haji had also served as the founder president of Puttur City Rotary Club and was the recipient of several awards including ’Paul Harris Fellow’ Award of Rotary International, annual Beary award of Bengaluru Bearys’ Welfare Association, ’Haribinger of Education’ Award from Markazul Huda UAE, Kannada Rajyotsava, and ’Gadinada Dhwani’ award. Haji is survived by his wife, four sons and four daughters.